Finda Baldé is 52 years old and lives in a small Pulaar village called Thiarap, in the Kolda region of southern Senegal. She has had 11 children, three of whom have sadly passed away. Families in Thiarap have always practised female genital cutting (FGC); a harmful practice and social norm that affects more than 200 million women and girls worldwide. Parents will have their daughters cut because they believe it is the right thing to do for social acceptance, and because it is an expectation held in place by their whole community. “I underwent FGC when I was a child. I noticed the negative effects of this practice during the delivery of my first baby,” Finda said. In Senegal, UNICEF data shows that 23% of women and girls between 15-49 have undergone FGC, however we know that, through the work of Orchid Project’s grassroots partner Tostan, over 8,000 communities across Senegal and West Africa have publicly declared that they are abandoning FGC, often together with the abandonment of child marriage. 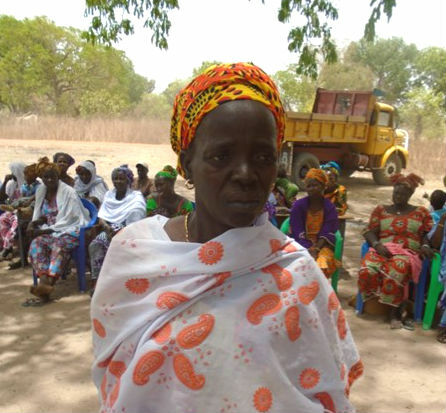 Finda’s village is just one of the communities that have now joined the movement to end FGC. Orchid Project partners with Tostan to support social mobilisation teams, groups of local volunteers from communities that have decided to abandon FGC, to visit other villages and share information and the message of why they made the decision to change. “Now, my village Thiarap has changed and none of my daughters have been cut. This will also be the case for all other girls in our community”. When the Orchid Project’s social mobilisation teams passed through Finda’s village, the Thiarap community did not want to discuss the sensitive topic of FGC at first, because it is considered a taboo subject. However, the social mobilisation agents from Kolda were able to convince some community members, including Finda, to represent Thiarap at an inter-village meeting in the nearby Doghel, with members of other communities that had already started to discuss FGC openly, or have themselves joined the movement to end the practice. Although representatives from Thiarap were reluctant at first, they actively participated in the discussions at the inter-village meeting in Doghel and made the decision to join the movement to abandon FGC. Through this decision, Finda is now committed to promoting the abandonment of FGC with other members of her community to preserve the physical and moral integrity of women and girls and the protection of their rights. This story has been adapted from a case study provided by Tostan to Orchid Project in April 2018.